In the first post, I worked out an upper bound for the average direct health impact of a doctor in the UK, and found it amounted to producing about 2600 QALYs. We can think of this, very roughly, as saving 90 lives. This doesn’t, however, show how much difference you make by becoming a doctor. Working this out requires a number of adjustments. The first is that we need to work out the impact of additional doctors, instead of the average doctor. There’s already about 200,000 doctors in the UK. By becoming a doctor, let’s suppose I increase the number of doctors to 200,001. And let’s assume that all doctors in the UK are equally skilled (we’ll relax this assumption in the next post). The extra doctor won’t produce a benefit of 2600 QALYs. That’s because doctors perform a huge variety of tasks. Some of these do more for the UK’s health than others. The NHS (to some extent) prioritises its distribution of resources so that the most effective tasks get done first. This is part of the remit of the National Institute of Clinical Excellence. So, if there’s one extra doctor, the tasks they do will be less effective than those that are already being done. So we’d expect an additional doctor to have less impact than the 200,000 people who are already doctors. This is called diminishing marginal returns. Approach 1: Life expectancy versus number of doctors. We see an ‘r’ shaped sort of trend: the life expectancy initially goes up briskly with an increase in doctors per capita, but this relationship levels off as the doctors per capita increases beyond 1 per thousand or so. So it looks like there are diminishing returns of adding more doctors. A similar picture emerges when other sorts of ‘investment’ in health are considered: see for example the plots of health spending per capita versus life expectancy, or GDP per capita versus life expectancy. This method of estimation isn’t perfect. It looks at all countries, whilst we might want to use data only from developed countries to look at the impact of doctors in the UK. Much like our previous post, wealth remains a potential confounder: both life expectancy and doctors per capita correlate with gross domestic product, and it might just be that richer societies are able to buy better education, hygiene, nutrition, and other things that really do the work of making their inhabitants healthier, and they coincidentally buy more doctors too. A lot of comments in the previous post were worried about quality of life, and not just length. Although I tried to account for this by Bunker’s estimates of how much good medicine does via removing disability, it would be nice to tackle the issue more explicitly. This graph looks like a mirror image of the life expectancy versus doctors per capita graph above. 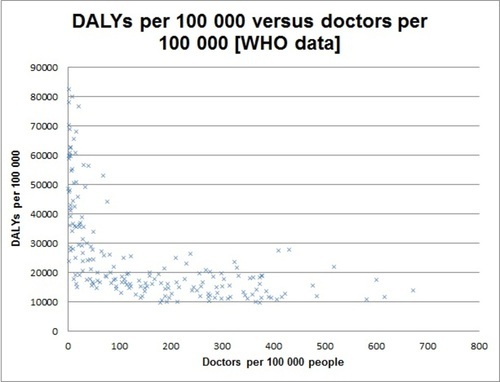 Although we cannot directly compare ‘DALYs averted’ to ‘QALYs gained’, using a similar technique to approach 1 (draw a line of best fit, work out how much gain one makes by moving ‘one more doctor’ along, and multiply appropriately) means each doctor averts 645 DALYs per career. This reassures us our figures are on the right track. These estimates are necessarily very rough, though it’s reassuring to find our three estimates in the same ball park. Splitting the difference between our three best estimates gives the impact of ‘one more’ medical career in the UK as about 760 QALYs, around a third of our estimate of the average doctor. Looking at the degree of noise in the data, I estimate the 95% confidence interval is about 600 – 920 QALYs. The expected impact of becoming a doctor is now around 25 lives: still pretty good, but giving 10% to effective charities can produce a health benefit 25 times larger than that. This underlines the importance of thinking at the margin for those wanting to make the biggest difference they can. One should try to estimate not how much good a career does in general, but how much more good they can do if you get involved. In the case of first world medicine, it appears most of the highest priority interventions for improving health and wellbeing have already been done, and so the additional impact of one more doctor is not that large. Our estimate, however, is still too generous. By becoming a doctor I won’t increase the number of doctors by one. Rather, it seems I’ll just take the job from someone else. I’ll be replaceable. We’ll look at this adjustment in the last post. 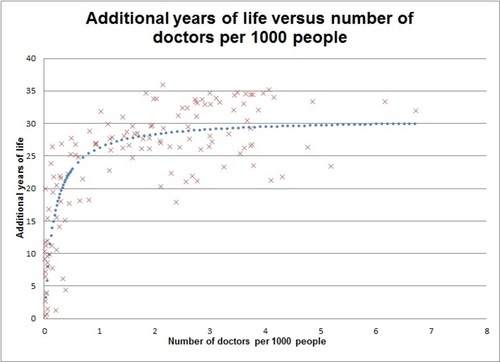 (2) First, we need to find the best fit relationship between number of doctors and life expectancy. 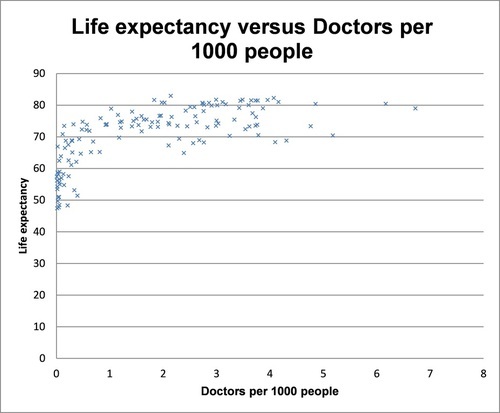 The best candidate for this is a hyperbolic curve: it seems plausible there will be a ceiling on how far life expectancy could rise through adding more doctors, even in the limit case of a population comprised entirely of doctors treating each other. Marginal change = 30.79459*(2.743016)/(0.16801+2.73016) - 30.79459*(2.743016)/(0.16801+2.743016) = 9.76877 * 10^-6 years. So the marginal impact of one more doctor in the UK will raise UK life expectancy by just under one ten-thousandth of a year. Putting this change into added years of healthy life requires us to multiply by the population of the UK, as well as a correction factor due to our [prior estimate] that for every 9 years of lifespan medicine adds, it adds another 5 years of healthy life via freedom from disability. This model explains about a third of the variance (adjusted R-square = 0.32), suggesting the main determinants of health in wealthier countries are not wealth, nor spending on healthcare, nor number of doctors. However, of these three it is health spending that is the largest factor, and the effects of either GNIPPP or doctors per 1000 population are negligible – neither are statistically significant, and 95% confidence intervals for either variable cross zero. In other words, we cannot be that confident, on the basis of this analysis, that increasing the number of doctors per capita increases life expectancy at all.